Want to see the size of a directory from the command line? You may have noticed that using the traditional ls command to list the contents of a a directory won’t necessarily show the total size of a directory. Instead, to see what the disk usage is for a specific directory you’ll want to use the dedicated du command, which will display disk usage statistics for any path or directory specified. We’ll show you how to use this command. 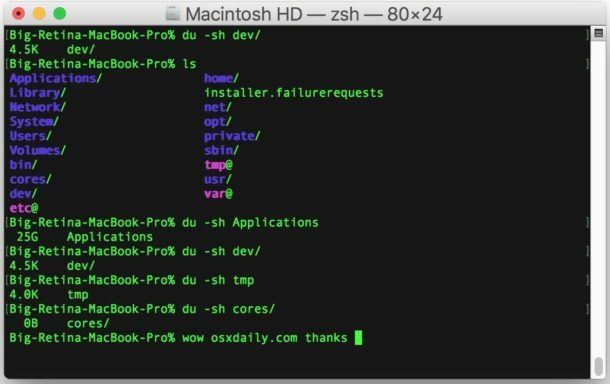 This is obviously aimed at command line users, and the du command for retrieving the size of a directory will work the same on Mac OS, mac OS X, linux, and most other unix varieties. For casual Mac users, an easier way to get the size of a directory is through the Finder using the Get Info command on any specified folder. You can use this to calculate the size of any specified directory and to see the size of containing directories and files as well. The -s flag will insure that each specific entry is calculated, and the -h flag will make the output in human readable size format (output of size will be shown kilobytes as KB and megabytes as MB, rather than bytes). We have discussed the disk usage commands here as well for du and the separate df command. This will show the size of everything in the current directory, including the total size of folders and the total size of individual files, in a long list format. Keep in mind that du is calculating the total file size of each directory, its contents, and individual files, and so depending on what your target directory is it may take a while to report the contents size back to you. Obviously the faster a computer, the faster this processing will take place. It’s also worth noting that if you only want to get the size of a particular file within a directory rather than the entire directory, you can use the ls -l command for that specific file instead. Know of another helpful trick to retrieve the size of directories from the command line? Let us know in the comments, and if you enjoyed this article you’d likely find our other command line material to be interesting as well. Better to install the coreutils; it’s du comes with a lot more options, e.g. output of the actual size in bytes (which is kinda important! ), inode info, apparent size etc. The macOS version is very rudimentary in comparison. Keep in mind that “du -s” is expensive! It does a recursive directory traversal. 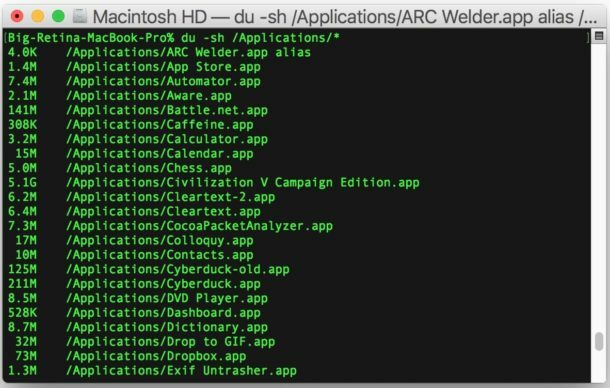 tried the command you noted du -sh /Applications/ in macOS Sierra however terminal going thru each file in my Applications folder one at a time showing access denied. After about 10 minutes i simply aborted the process. No doubt i did something wrong. Give it a go, good luck, bro! The -d 0 limits the depth and gives me an overall total of the directory I am in.